2018 ended with the very sad news of the death of a wonderful woman and former work colleague with whom I’d reconnected on Twitter in recent months. That made it extra hard to feel any sense of celebration about a new year. January 1st began at 3am as usual with the now nightly clean up due to the issues affecting one of the members of this household, then the morning started with a beautiful new year smile from my disabled daughter B. It should have been enough to put me in a good mood. But it wasn’t. This will be a milestone year : my youngest turns 18 in April and I will then be the mother of adults. But no prospect of an empty nest or a chance to live my own life. Instead my parenting duties seem more intense and overwhelming than ever. I feel so trapped by it all, and crushed by the knowledge that I’m the only one who can engineer an escape plan that ensures a better future for all of us. Yet I felt bad about feeling bad at the start of a new year that many will not see. So I did what I have to do most days, and chose an activity to boost my mental and physical energy and endurance to do all that has to be done. Today’s choice was another parkrun with B, with a more civilised starting time of 11am. Then we made a non alcoholic tiramisu to use up more of the left over naughty food in the fridge, and after dinner B ‘supervised’ me doing the laundry and putting the bins out followed by one last video before bedtime. Between her bedtime and 3am I got some free time for Netflix, some sleep time and some worrying time about how much longer I can keep going. But at least this New Year’s Day I did more than just chores and supermarket shopping trips. There’s more to life than cleaning showers was what I used to mutter under my breath when the student flat cleaning rota was being given out. And I guess I still feel the same today. Words to live by for the months ahead! How was your New Year’s Day? …Seemed a bit more manageable. A request was made for a homemade chocolate cake, and it was agreed that my reliable 5 minute recipe would do. The result? Three happy young adults, and a bit of stress free baking therapy for me. Entries opened for the Dublin Women’s 10 kilometre Mini Marathon yesterday, and I got my place, and it’s in the runner’s section at the front – I earned an automatic qualification thanks to last year’s time. So no pressure, and I now have something to look forward to, as last year’s Mini Marathon was definitely one of the best days of 2017 for me. There’s something very special about being part of such a massive event that involves running around the streets of Dublin with 40,000 other women. Yesterday was an historic day for the disability community in Ireland. After TEN LONG YEARS Dáil Éireann (the Irish Parliament) finally voted to ratify the UN Convention on the Rights of People with Disabilities. Every other EU country has already done this, and I am one of many people who protested with weary regularity to make this happen. I won’t be stopping now either, as this is just the start, next we have to ensure that the Government acts on the convention, and actually improves the lives of disabled people in Ireland. But it was a good start. Some days I clock up 10,000 steps by 10am, according to my new toy smartwatch. Though I think its definition of steps is generous. Still, rushing around at 90 miles an hour has been my modus operandi for as long as I can remember and last week it caught up with me. Yes readers, I was felled by a virus. Not a dangerous virus, but combined with stress and lack of sleep, the effect was quite scary. For a couple of days last week I thought I was going to collapse. Then lulled into a false sense of security by a good night’s sleep I took part in Saturday morning’s 5 kilometre Parkrun, pushed myself to the limit on a freezing cold morning, was the third female to finish and ended up in the GP surgery on Monday evening after also spring cleaning the house and car before the arrival of visitors. The GP prescribed rest with a rueful smile, knowing that rest is not really possible when you are a lone parent carer. But something had to give. I’ve slowed down. I’ve stopped obsessively exercising for now, and I’m trying to move more slowly, and think more slowly: finishing one train of thought before rushing on to the next one. I’m even doing a bit of mindfulness. It’s not as annoying as I feared. And slowly I seem to be improving. So if I’m not around so much, that’s why. Of course I might decide I like slow living, but somehow I suspect I will back to my normal racing pace before too long! ‘Ordinary lives in ordinary places’ is the buzz phrase in disability policy right now, and you’ll have seen it before on this blog. It appears to mean providing the supports and services that disabled people need to live independently in the community. But as far as I’m aware there’s no room in this policy for those with expensive high supports needs (severe/profound disabilities). The implicit assumption is that families will provide cradle to grave care and be responsible for ensuring that their loved ones enjoy a fulfilling life too. I think that’s very unfair on my disabled daughter B, but for now I’m going to make best of it, and try to create a good life for both of us. And this week we made a lot of progress. On Wednesday I went to see B learning how to use a powerchair. It’s early days, but she has the most patient person I have ever met working with her. I’m so grateful she has been given this opportunity, and while she has a lot more progress to make, it was fabulous to see her reaching for the joystick, especially as it’s currently positioned in a difficult place for her to reach, due to her limited range of movement. A dual control powerchair would give her more freedom, and conserve some of my energy too. So I really hope she succeeds in proving she can do this. I think she can. B enjoys bowling, especially with friends and when it’s quiet enough so she can hear the background music. It’s also one of the few sports she can do unaided, though when we went this week with the Rainbow Junior Arch Club, she needed a bit of hand over hand assistance to remind her what to do. But I am not a fan! Especially as bowling alleys are usually hot, dark and noisy, and the sun always seems to be shining outside, where I’d much rather be. But a good life has to mean that I must try and enjoy B’s favourite activities, as well as bringing her to things I know we both enjoy – like music festivals. My eldest daughter always tells me that I can learn to love something if I persevere with it – she said it worked for her and green tea…. Going with the Club at a quiet time meant it was much more enjoyable for me, and I will try my best to go again. I haven’t taken part in an evening race for about 20 years, but I decided to be brave and try and run a 5K race pushing B on Thursday evening. It was organised by a friend of mine in aid of Snowflakes Autism, a local charity that helped one of my other children in the past. 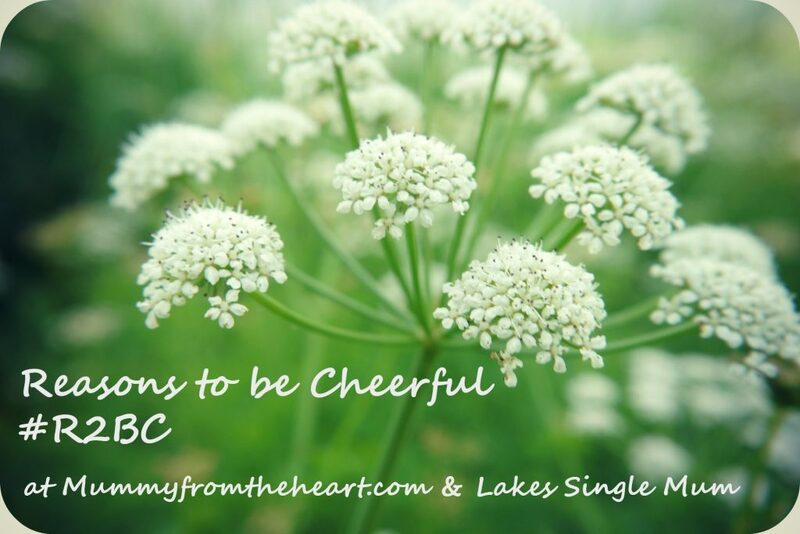 So those are my reasons to be cheerful for this week: head over to Mummy from the Heart for more. How to explain the Mini Marathon and why it’s so loved by so many women? After all, isn’t it just a 10K race that takes place every June Bank Holiday weekend through the streets of Dublin? Yet it’s so much more than that. For me the highlight is the countdown to the start, with the nervous smiles among the runners, the anticipation, the watches being checked, water bottles discarded, goosebumps from the strains of Sisters, are doing it for themselves, and knowing there’s 30,000 more women at your back. You feel like you’re part of something. It’s the biggest women only race in the world and one of the biggest charity fundraisers in the Irish calendar. I’ve probably told you before that I ran it many times in the past, until life got too complicated! And that my first attempt was in 1992 when I was 5 months pregnant with my eldest. This week she walked it pushing her disabled sister, with the help of a couple of friends. And despite the rain that set in as I finished and they reached half way, we all loved the experience. For me, almost everything went right. I wasn’t feeling well, but with the help of a really fast course, I crossed the line in a very satisfying 57 minutes and 15 seconds. Which means I qualify to enter as a runner again next year. And if I can keep that up, I will do it every year (once I have someone to mind my disabled daughter – or push her round for me). And having something special to look forward to every June from now on is my reason to be cheerful for this week. Head over to Lakes Single Mum for more. I hope you’ve noticed all the positive posts on here? I’m trying really hard to stop moaning, and it’s helping me too. But the problems in my life haven’t evaporated with the summer sun, they’re still floating around and keeping my anxiety levels bobbing up and down. I’ve been forcing myself to drink tea on shaky days, but without feeling much relief. In desperation one day recently I chucked in a spoonful of sugar as well, and the difference was amazing! Who knew that the biggest dietary enemy was just what I need to feel better? So finding something that helps is my first reason to be cheerful for this week. … I fixed the coffee machine. It had almost completely stopped working and I was considering throwing it out until my google searches finally revealed the solution to the problem. Result. And a great feeling of competence. … After SEVEN years, I’ve finally got the garden looking reasonable and as low maintenance as possible. Well apart from my pots. Have to have a few flowers. … A new low cost gym, a new Lidl and one of my favourite coffee shops are all opening just up the road. Perhaps I don’t want to move after all. … Breakfast and a run on the beach with friends at a local seaside town. … A mini holiday and a few outings when family visited for a long weekend. … Lots of great news for my disabled daughter. … After the training, the qualifying, the arranging, the day is finally here : I’m running in the world’s biggest women only race tomorrow, the fabulous Dublin Women’s Mini Marathon. Cannot. Wait. That’s what I was told when I announced I planned to run a 10k in under an hour in 2017. In all fairness, what the speaker could see in front of him was a fat middle aged woman swaddled to the nines in ancient running gear. Not an inspiring sight! But what he didn’t know was that I have a track record of proving people wrong, and those words spurred me on over the past year as I slowly prepared to tackle the Great Ireland Run. You see I’ve been waiting to do this for more than ten years. I tried in 2011, but didn’t make it across the finish line in under the hour. And this time it felt even more important. Age is not on my side, and 2017 was the perfect year for the attempt: my eldest is still living at home, my disabled daughter is loving her day programme, but it’s only guaranteed until the end of August, while my teenage son has no exams this year. As well as that, the training went well: I had a partner in crime, my friend Lisa, and we pulled and pushed each other on many runs, often as part of Pat’s training group in the Phoenix Park – held in the mornings, so I can actually get there. My eldest daughter looked after her brother and sister for me as I squeezed in random training runs whenever I could. And I also benefited from going to gym. It was not a heavy training schedule – no more than 3 1/2 hours a week in total – but it was hard, and I was stiff and sore for most of the past three months. But now I am slimmer and fitter than I have been in a long time, which will help me continue in my caring role too. Race day was perfect, cool and calm and everything went to plan. Just as well, as the Great Ireland Run is not an easy course: You’d lose count of the number of hills, and I certainly slowed down to a crawl on the last one: so thankful to the lovely woman who encouraged me to keep going, and told me that I was still on track to make my target time. So I sped up as soon as the course levelled off over the last two kilometres, desperate for a sight of the finish line. And the time read 57 minutes. I couldn’t believe it. First came the smiles, and then I was overcome when I finally crossed the line. I staggered to a halt and burst into tears. So of course the medical team rushed over with concern and a sick bucket! And I gabbled on about how important the day was for me. I expect they thought I was completely mad. For the past 30 years, I’ve rated running the London Marathon as one of the biggest achievements of my life. It’s now been beaten. Finally I have to mention the glorious Liz McColgan, whose winning 10K run at the Tokyo World Championships in 1991 is always at the back of my mind any time I felt like quitting. Thank Liz! With two weeks to go until the big race, I’m starting to struggle. I’ve been training on and off for the past 18 months; I’ve been hurting all over for the past number of weeks, and I am so so tired. And I’m still not running fast enough to guarantee making my target time. A bit of inspiration to remind me why I run was badly needed, so I came up with five good reasons to keep me motivated. And here they are, in no particular order..
Running for health and fitness gives me a justifiable excuse for leaving the house and the list, and getting out into the (reasonably) fresh air. Sometimes it’s very fresh, if I get the chance to go for a run in the park or along the sea front. It’s not a self indulgence, so I don’t need to feel guilty – but I still have to tell myself it’s okay. It’s easier than dieting. No really, it is. With running you have to be mentally tough enough to resist stopping for about half an hour. And do that 4-5 times a week. With dieting you have to be mentally tough enough to resist eating all the time! Also I do lose weight when I exercise harder, which seems to go against expert opinion. I’m still eating cake, but I’ve lost about a stone (6 kilograms), and that makes me very happy. Running gives my brain a break: I find it impossible to think about my worries when I’m running flat out, and it’s taking all my focus to keep my breathing steady and my legs moving. It’s about adding something to your life, which has to be a bonus as I’ve found that getting older and becoming a responsible adult and parent seems to be mostly about giving up things. I’ve always been competitive, and running gives me a chance to compete, against myself and others too. It’s good to feel you’ve achieved something, especially as there is very little sense of achievement or recognition when you’re a carer. Okay so maybe ‘slightly overweight’ middle aged mum would be more accurate, but fat makes a better headline, right? Anyway, I’m 11 stone and a size 14 which is huuuuuuge by fashion industry standards and I have fat in places where no fat should be. Which is why I will never wear a bikini again! This is the fatter me recently, running in the Phoenix Park in Dublin. In the rain. London Marathon 1987, one of the best days of my life! This was me in my mid twenties on a very proud day. But my running career had an inauspicious start. Three years earlier I could’ve been voted employee least likely likely to run for a bus. My colleagues mocked my attempts at jogging, and when I announced my intention to run a half marathon they sponsored me large amounts per mile… But I got the last laugh, and a local charity did extremely well when I finished in just over two hours. All you need is a pair of trainers and a bit of determination to get started. But you’ll soon want to spend some money. For comfort and to avoid injury you should invest in a good pair of running shoes bought from a proper running shop where advice is available. Plus a supportive sports bra (unless you’re a man, I guess!). And there’s lots of amazing, gorgeous and useful running gear now, with quick dry fabrics and even bum bags with water bottle holders! Running on your own is hard to do all the time. I would definitely recommend joining a running group or club. You can find them via social media, sites such as boards.ie (Ireland) or apps like MeetUp. A goal will keep you focused and keep you going. Whether that’s a regular 5K #Parkrun or a marathon, it will help you leave the house on those days when you’d much rather slump on the couch with a tub of Ben & Jerry’s. Variety also helps avoid boredom: take different routes, take photos when you need to stop. Try longer slower runs, or shorter faster ones. Try different locations and times of the day, running in sand or up hills will test you, but the scenery will be great, and there’s something special about running in the city early in the morning when it’s quiet and fresh. Races are fun to test yourself and to experience the feeling of running with a crowd, getting a medal, a T shirt, and maybe raising funds for a good cause. Struggling to find a babysitter? Run with a buggy. They are welcome at some parkruns and bigger races too. I slowly ran the Great Pink Run 5K course last year pushing my adult disabled daughter. Running apps, love them or hate them, they can be motivational. Most people I know use Runkeeper. Need a break from running? Take it. Your legs will remember the training you’ve done and it will be easier going back than it was starting out. Running may not feel easy at first, but if you push through, you should get to a point where you feel comfortable running at a pace that’s right for you. You’ll enjoy the feeling of moving, of meeting other runners, of looking at the world around you, and the fresh air. Our bodies were made to run! As for me, I’m running for my life. To keep me alive, to give me more energy for my children, to help me ditch medication, and to battle anxiety and depression, the life partners of many family carers, including me. So to all the middle aged women out there who say they cannot run, I have this message: Yes. We. Can.